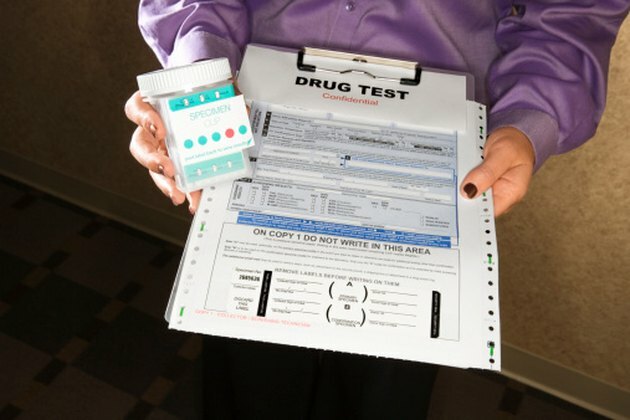 What Causes False Positives in Marijuana Drug Testing? Drug testing has become a way of life in our culture. It is now required with many job applications and for participation in school athletic programs. Testing for marijuana most often consists of a urine test, according to the Centers for Disease Control and Prevention. While most people who do not use marijuana will test negatively for the substance, some medications can cause a false positive reading. It is wise to bring all medications along when you're being tested for marijuana. According to the Centers for Disease Control and Prevention, marijuana is the most widely used illegal drug in the United States. The urine test for marijuana is based on the detection of 9-carboxy-THC, a metabolite of the primary active component in marijuana. A urine test used by many labs is EMIT, or enzyme multiplied immunoassay technique. According to NORML, a group devoted to marijuana legalization, this test itself is prone to errors. Human errors, such as labeling errors, inadequate training of laboratory staff and fatigue or boredom are also possible and capable of producing a false positive result. Protonix--generic name pantoprazole sodium--is a proton pump inhibitor used in the treatment of GERD. Protonix' manufacturer warns that it can cause a false positive reading for marijuana, according to Drugs.com. People taking Protonix should always bring the prescription bottle with them to show the laboratory staff when drug testing is done. NSAIDs, or non-steroidal anti-inflammatory medications, such as ibuprofen, Orudis KT, Advil, Motrin and Aleve, were once thought to cause false positive readings for marijuana. According to NORML, this is no longer the case due to improved testing methods. Other sources, such as Star Detox, still list the above medications as being able to cause false positive readings for marijuana. The best thing to do would be to bring all medication bottles with you when you are tested. Marinol, generic name dronabinol, is a medication widely used to combat the nausea and vomiting associated with chemotherapy, according to the U. S. Drug Enforcement Agency. The active ingredient in Marinol is synthetic THC. It is also called "medical marijuana" and will cause a positive reading for marijuana in a drug test. Anyone on Marinol therapy should bring their prescription bottle with them when having any drug testing done. Hemp seed oil, kidney disease, diabetes, liver disease and riboflavin, or B2, are also thought to be capable of causing a false positive result on a drug screen for marijuana, according to Star Detox. Documentation of the disease, or the pill bottle for any of the medications listed, should be brought along to show to the laboratory staff during any drug testing.